Dometic Group is a global company, providing solutions for” mobile living” within the areas Climate, Hygiene, Sanitary and Food&Drink. The mission is making mobile life simple. The company group who 2015 had a turnover of 11 billion SEK, have appr. 8.000 employees and production in 22 countries. One of the production plants is Dometic Seitz in Tidaholm; a company with a long history. As early as 1799 the former Tidaholms Bruk got ironworks privileges and started production of horse carriages. In the early 20th century the production switched to more effective vehicles and serial production of trucks started. When the Kreuger crash was a fact, the truck production was sold to Investor, headed by the Wallenberg family – and it is in fact here we find the origin of the Scania trucks. Nowadays there is no production of trucks in the plant in Tidaholm, but the step to the automotive industry is still short. 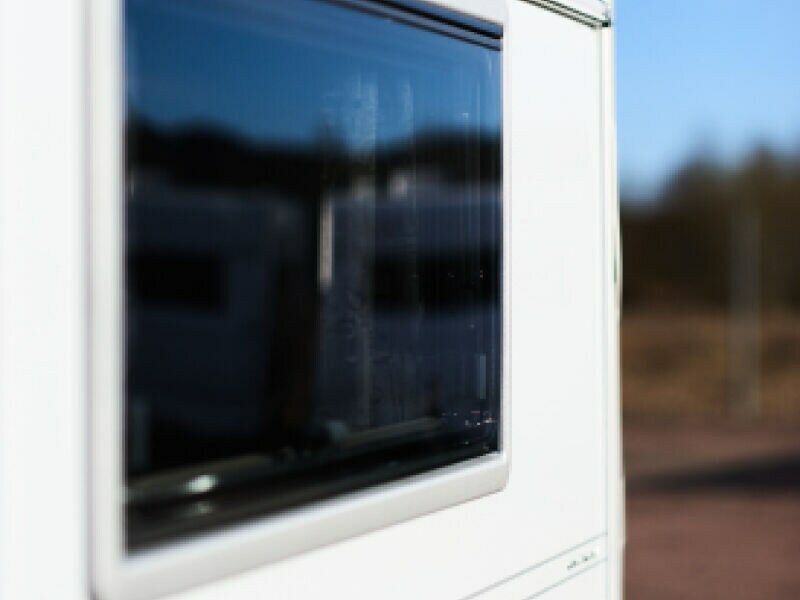 Since 1964, Dometic Seitz in Tidaholm have produced car windows, sun roofs and doors to recreational vehicles and at the moment the production is booming. 800.000 windows are produced and installed here in one year. Right now we are picking market shares at the same time as we see an enormous large increase in demand, especially from the producers of campers. The increases in volume 2016 was so extensive, that we had to recruit 10 new employees. Parallel to this we also invested in a new CNC-milling machine, a Routech Ergon, from S.I.T., says production manager Mats Borg. When we decided on this investment, the reason was to be able to get rid of the weekend shifts, which we managed to do – during a shorter period. However, the continued strong development in volume means that we had to put in weekend shifts again to manage the production, says Mats Borg. From Dometic’s side, a thoroughly procurement was made before the investment. 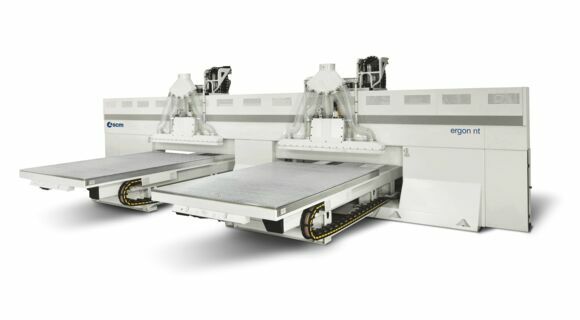 There were 3 potential suppliers of a new CNC-milling machine, who were able to leave quotes, but Mats Borg and his team was not satisfied with that. Admission of references and site visits at customers who already had similar machines in production, was an important part of the procurement work. "Even if we have a relation with S.I.T. since earlier, and are satisfied with it, this is such a large investment that we really want to do a thoroughly procurement work. That is why we also wanted to visit other customers, to see how they had experienced both the startup, the dependability and the service level of the suppliers", says Mats. Reduced material waste, but especially more units produced per kWh, was some important issues for Dometic, who has sustainability as one of their focus issues. But in the end it was the responsiveness together with the fact that the offer from S.I.T. was the one giving most value for money, that decided their choice. Also, both Mats Borg and Daniel Bergåker, process technician at Dometic Seitz, praises the response from S.I.T. both during the procurement process and the installation. "They have showed an ability to really listen to us and give response to what we needed and was looking for", says Daniel Bergåker. "But what really impressed us", says Mats Borg, "is the startup of the machine. I have never earlier experienced such an uncomplicated and secure commissioning of a new machine. The installation, done in less than 3 weeks, was managed by a couple of men. Already 2 weeks later we were up in full production. This is really impressive!" As the responsible process technician I also appreciate that the AlphaCam program, also from S.I.T., which we use for the programming of the CNC milling machine, is so simple and self-instructive, says Daniel, and in the same breath he says that they really haven’t had more than one small malfunction since the startup. A problem which was quickly and simply solved over the phone in less than 30 minutes. A pain free installation, an improved dependability and increased production rate – yes, you cannot mistake that Dometic are satisfied with their new Routech Ergon. "We have a continued strong increase in volume, so in spite of efficiency improvements with the new CNC milling machine, we have to reintroduce weekend shift to manage the production, says Mats Borg. So I don’t think it is impossible that there will be another Routech Ergon from S.I.T. here in the future", Mats Borg concludes. Ergon R400 TVN is a special solution designed and produced in the Routech plant of the SCM. It is a work centre with double bar table, each one with a useful area of 2850x1850 mm. Specific hold-down equipment ensure the perfect finishing quality of the client’s pieces: car windows, in specially shaped methacrylate. 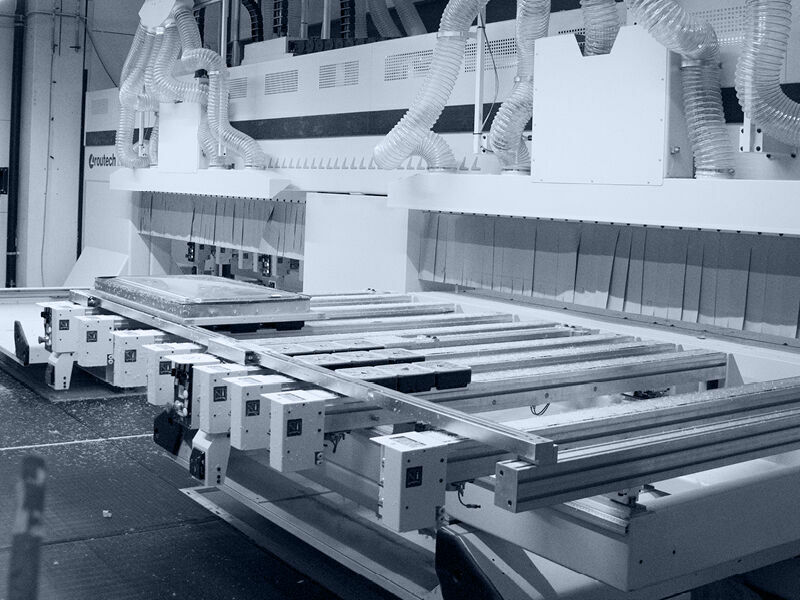 On each table the routing and drilling operations are carried out by a 5-axes machining unit. Therefore two machining units in total that can operate in parallel or independently, to fulfil all productivity and flexibility requirements.